Wonderful fenced large deck is great for everyone to enjoy. This inviting cabin also has level access. The house has three sources of heat. The wood burning stove is located in the living room of the cabin. There is also a propane stove in the family room and propane heat throughout the house. Great kitchen with plenty of space for shared cooking! And new appliances and granite countertops. Breakfast bar offers seating and room to visit. The dining area is directly off the kitchen and living room. The table seats 6 easily. There is also a folding card table and additional chairs to seat 10 total for a meal. Second bedroom is upstairs with a queen bed. The master bedroom on the main floor has a queen sized bed. The master bedroom also has a bath with shower. 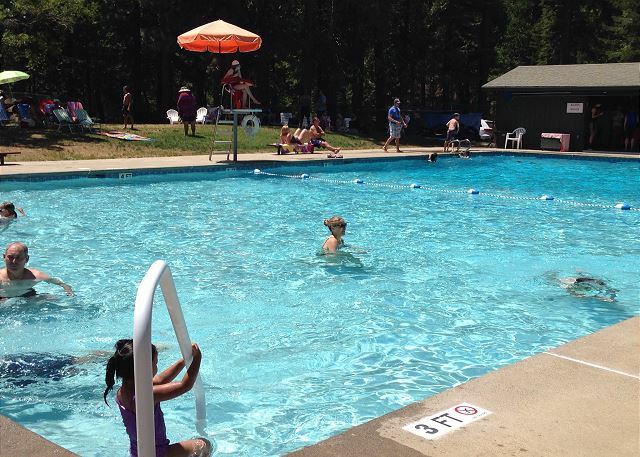 Cabin rental includes summer use of the Big Trees Rec Center facilities which offers both kids and adult pools. Guest fees apply for pool use. Plenty of fun play areas and shady picnic tables at the Big Trees Rec Center. Come kayak, canoe,fish, swim or just enjoy the view at our alpine lakes. Bluebird Cabin is close to the Stanislaus River and many other local watering and fishing spots. California Caverns is just one of the many local attractions. Downtown Murphys is a favorite shopping and dining spot. ALL CABINS HAVE A HOUSEKEEPING CHARGE AND COUNTY TAX IN ADDITION TO THE RENT. 3 Night Minimum During Holiday Periods. Charming and comfortable home, great for children and dog friendly. Wireless internet, cable TV. Spacious great room with wood burning stove, dining table, window seat for reading, and a sleeper sofa. Adjacent recreation room has propane stove, TV, VCR/DVD player with a selection of movies, books, board games and a caroms game table. 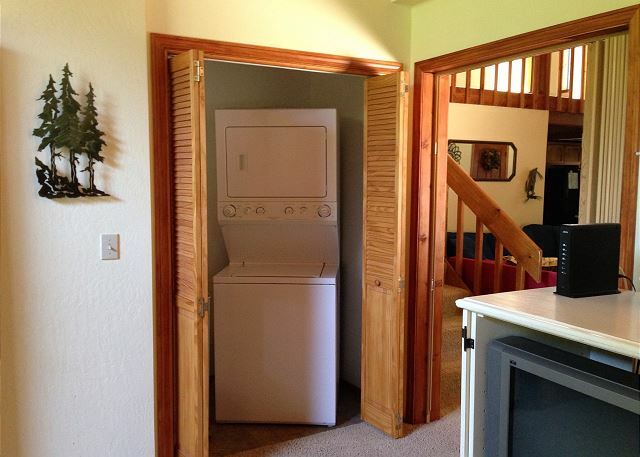 Washer/dryer, and half bath also on main floor. Large deck with patio furniture and propane BBQ for outside seasonal dining (BBQ is stored in winter) . Three bedrooms -- main level master bedroom with queen bed, two upstairs bedrooms, one with queen bed and the other with a double bed and bunk beds. Level lot provides easy winter access. Located in Dorrington, along California scenic Hwy 4. Situated at 5,000 feet, you can experience each season at its best, spring dogwood blooms, warm summers, dramatic fall foliage, postcard winter scenes. Short drive from Big Trees State Park and the Stanislaus River, which features excellent fishing. 25 mins. from Bear Valley Ski Resort and Lake Alpine. Cabin is half a mile from Big Trees Recreation Center available for summer guest use (guest fees apply for pool use). Check out facilities & activities at http://bigtreesvillage.org/recreation-center/. No smoking. Dogs OK with prior approval. $25 per dog fee willy apply. This was our third stay at Bluebird and won’t be our last. We love all the light and sunny ambience. It is very spacious and comfortable. We love the snowman china, too! Beautiful, easy entrance, huge sunny deck! Wonderful family time. We had everything we needed. Beds were comfortable, nice kitchen, great patio and family area. A delightful stay in a beautiful, secluded home in the mountains. The Bluebird House is a lovely home in a very quiet neighborhood, close to Big Trees, Bear Valley and Lake Alpine. The home had everything we needed for our stay and we barbecued on the deck each night. We retreat to the mountains every year and have always been very pleased with Sierra Vacation Rentals. We look forward to our next visit! well above our expectations, really felt like we were in a nice home...rather than a hotel. The setting is so peaceful and quiet. This is a great place - spacious, big decks, great setting. It's set back from the road so it has a more private feel. And there is a great wood burning stove that really warms up the living room in more ways than one. This is one of the nicest most beautiful house we have stayed in all the years coming up here. The kitchen was a pleasure to cook in. The holiday dishes were delightful.Great pots/pans. lots of space for grandson to run around. A well designed home. We would definitely rent this house again! Warm and cozy. Loved the window seat!A very comfortable house for two couples and kids. We are so glad you enjoyed your stay at the Bluebird cabin. The home is very well kept and well appointed. Thank you for continuing to stay with us! We had a wonderful stay at the Blue Bird house. Everything was clean and in working order. The kitchen is very well equipped for cooking. Nicely furnished. We would love to return for another ski weekend! The Bluebird house certainly is a wonderful rental. It is newer, with lots of afternoon light and a warm, cozy feeling in a beautifully wooded setting. We are so glad you enjoyed your stay and hope to see you back in the future! Great home. Thanks for the wifi connect. No other way to communicate with the outside. Very clean, quiet. Thanks for the comments. The Bluebird house certainly is in a great, quiet location. There is internet available at the house as well as a phone with local calling. The Bluebird House has all the amenities of home with quick and easy access to all the Sierras have to offer. Thank you for your repeated business. We are so glad that you enjoy the beautiful Bluebird House and the Sierras! The property was nice, clean and the owners were very helpful. The cabin is relaxing, comfortable and well-appointed; a wonderful rental for families with kids. The location is ideal with amenities nearby as well as being a short distance from fishing, hiking and skiing. Will stay again! New Year's Trip in the snow! Great experience. Lots of room for the whole group. The kitchen was fully stocked and there is actually an extra 1/2 bath off of the red living area which was convenient. Flat corner lot so room to play outside and easy to park. Great stay! Our family loved our Holiday week spent at this spacious, well maintained home. The fire stove was cozy and they even had little lit trees in the corner of the family room - made our Christmas morning all the more special. Wonderful place! We are so glad you enjoyed your stay and we hope that you will be back soon!